The cruise ship industry is shifting from passengers shipper to experience provider. Information about passengers’ satisfaction is of critical importance. That includes data about how customers interact with services and spaces, how they feel and react to the designed situation. In this project, we were looking for novel concepts and solutions to monitor passengers’ experience, collect data and present the data to Meyer Turku’s designers. The experience goals for the project were: EXPLORATION, DISCOVERY and COMPETENCE. For the Exploration stage we wanted to present the users with the possibility to seek information that can be relevant for them, this was done in the form of an Interactive Report about passengers on-board ships currently in operation. 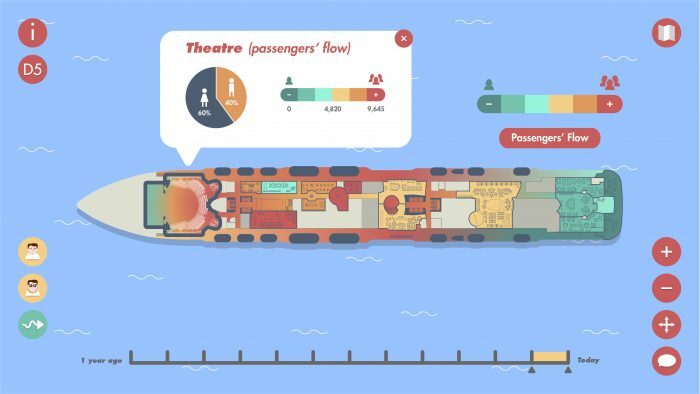 In the Discovery stage we wanted designers to be able to find if the concepts that they are designing could work in real life, for that goal we implemented a Predictive Analysis (or design concept testing) tool that allows them to simulate the conditions of passenger behaviour on board the ship. Competence experience goal was achieved through peer and client validation, we enabled users to share comments and feedback with other stakeholders and have a sense of reassurance in their work. Explore and discover the passenger behaviour and satisfaction data in an environment similar to a simulation or city-building video game, while being able to test and validate design concepts in simulations and get feedback from peers and co-workers. 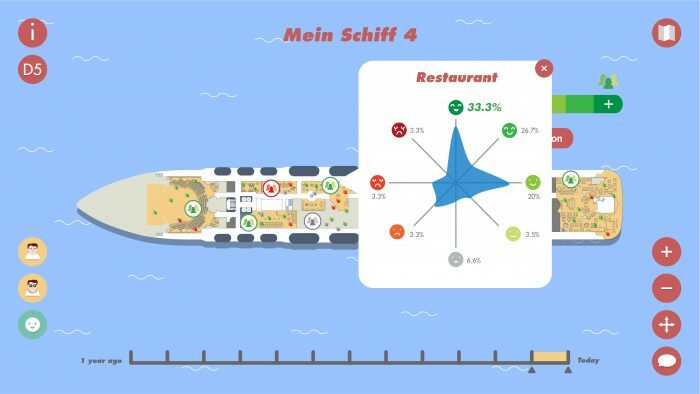 +EXp provides a visualization platform for an engaging and fun visualization of different types of data related to passenger behaviour, satisfaction and performance of staff and spaces on the ship.